Yet more treats for Blogger's 10th birthday celebrations were released for us today! When readers share your blog and posts, additional parameters are added to the URL which helps you track the syndication of these posts using Google Analytics in the format "?spref=nn" where the nn part is changed to fb for Facebook, tw for Twitter or gr for Google Reader. You can then search for URLs ending with these parameters when using Google Analytics to view details of how your posts have been shared. 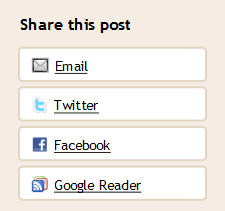 Of course, this new feature is only available to those who have not chosen to hide the Blogger Navbar! 1. Go to Layout>Edit HTML in your Blogger dashboard. This should be located within the <b:skin> or <style> section of your template. Delete this section of code, then preview your template. If all is well, the Blogger Navbar will be visible again, enabling your readers to syndicate your posts with ease. Instructions to hide the Blogger Navbar can be found here. What do you think of the new Navbar "Share" feature? I admire the determination of the Blogger team to roll out so many new features for this platform in just a few short weeks! The addition of this sharing feature will be useful for many bloggers, though those of us who choose to hide the navbar for aesthetic purposes will need to adopt other methods of sharing our posts. What do you think of this latest birthday gift? Will you find this useful? Is this enough to persuade you to display the navbar again (if you have currently chosen to hide it)?